“Aha” I thought to myself. “This is it.” The Fly Lady understands me and my home. She knows how depressing it is to come home to a messy, disorganized home. She knows how overwhelming the piles of “stuff” can be and how hopeless perfectionist types can become when faced with the messiness of it all and just give up. While my home is far from being featured on “Hoarders, Buried Alive,” it also not going to be featured in “Better Homes & Gardens” any time soon either. As an INFJ on the Meyers-Briggs Type Indicator, my J’ness wants organization. I like my DVD’s alphabetized. I can’t stand that my iTunes library has duplicates that I can’t get rid of! I want everything in its own place. So when I came upon the Fly Lady website a few years ago, I readily jumped on the Fly Lady bandwagon. The first step in gaining control of the CHAOS is to clean your kitchen sink and then shine it every night before you go to bed. The shiny sink then smiles up at you every morning when you wake up encouraging you to tackle the next “hot spot” using baby steps. So I did. My sink sparkled for less than 8 hours. When I got up the next morning, sitting in the middle of my shiny sink sat an empty glass. Sigh. I tried to teach my family the rules, but they never seemed to stick. Every now and then, I will try the system again, but inevitable give up. Discouraged. You see it felt as if as soon as I got one room neat and organized and moved to the next one, somebody or somebodies came along and trashed it again. The other day I saw a quote posted on Facebook that read, “Cleaning with children is like brushing your teeth while eating Oreos.” I laughed out loud at that one. How totally true!!! So they other day when the girls heard a mouse in their room, my first instinct was to purge. The idea of renting a huge dumpster and having a huge toss it fest really appealed. Instead I told them to clean up their room so their dad could set some mouse traps and catch the varmint that was interrupting my sleep. Interrupting my sleep not because I was worried about the mouse so much (living in an old farm house I’ve learned to put my rodent fears aside, although I’d still scream if one actually crawled over me), but rather because the girls couldn’t sleep with the idea that a mouse cohabited their room. they no longer played with. Good girl! I thought. Let’s get the dumpster or at least some trash bags. But no, they decided we should have a garage sale. I told them if they wanted to have one they could, but I didn’t have time to help them. In the middle of dusting and vacuuming the living room, I was in no mood to help them in what turned out to be a ploy for getting out of actually cleaning their room. So, they excitedly brought down old Barbie dolls, books and stuffed animals and spread them out over a card table. They made signs and sat in the hot sun and waited and waited and waited. I actually felt a bit sorry for them. Like I said we live in the country. 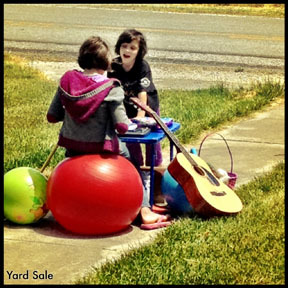 We don’t get much traffic on our road and we didn’t advertise the “sale.” After an hour or two they dumped their stuff in the living room and complained about their lack of sales. By the way…we did catch the mouse so at least now my sleep cycle is back on track. So, how do you keep chaos under control?